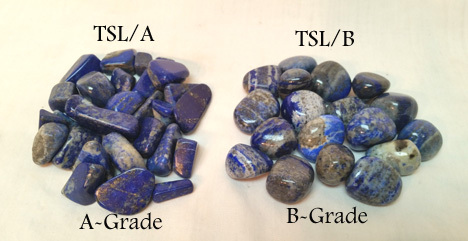 We now offer our Lapis Tumbled Stone in "A" and "B" quality! The "B" Grade Lapis is a medium sized polished tumbled stone and is approximately 3/4" in size. The "A" Grade is available in medium (approx. 3/4") and large (approx. 1"). It is sold in 1 pound increments. Price is $13.00 a pound, sold in 1 pound bags. Labradorite Tumbled Stone is a medium sized polished tumbled stone and is approximately 3/4" in size. Labradorite is truly a fascinating mineral. Labradorite can produce a colorful play of light across cleavage planes and in sliced sections called labradorescence. The usually intense colors range from the typical blues and violets through greens, yellows and oranges. Some rare specimens display all these colors simultaneously. Price is $10.00 per pound, sold in 2.5 pound bags. 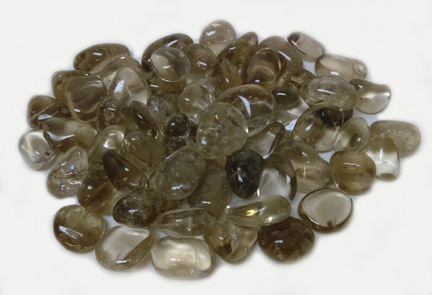 Smoky Quartz Tumbled Stone is available in two sizes. Order in 2.5 lb. increments. Example 1 bag equals 2.5 lbs. Medium stones are approx 3/4". Large stones are approx. 1". Price is $17.00 a pound, sold in 1 pound bags. Clear and White Quartz with Black Tourmalated inclusions. 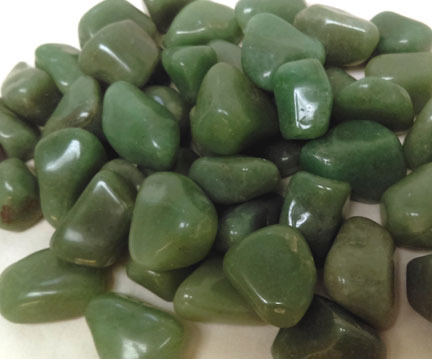 Aventurine Tumbled Stone is available in two sizes and sold in 2.5LB bags. Medium stones are approx 3/4". Large stones are approx. 1.25". Carnelian Tumbled Stone is available in two sizes. 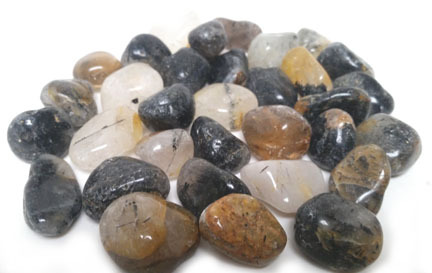 Medium stones are approx 3/4" and average cost is per stone is .10 ea. Large stones are approx. 1" and average cost per stone is .20. For a limited time only we are offering Extra Large Carnelian Tumbled Stone. It measures approximately 1.25" - 1.5". 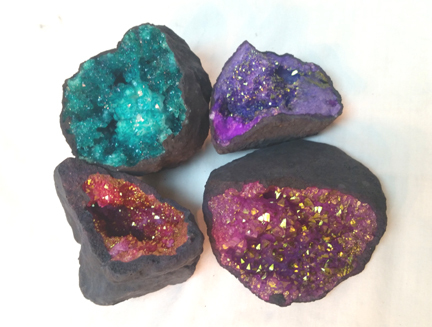 The latest addition to our Moroccan Geodes line. These are sure to be a children's favorite. These black shelled dyed geodes stand out from across the room. Purchased by the bag with 32 halves @ $1.25 each. 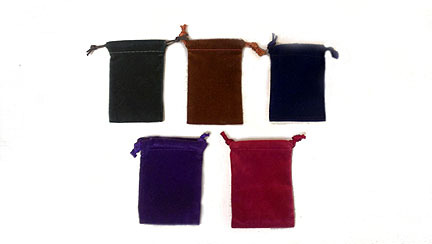 Only available in assorted color bags. Sizes vary from approximately 2" to 4" across. 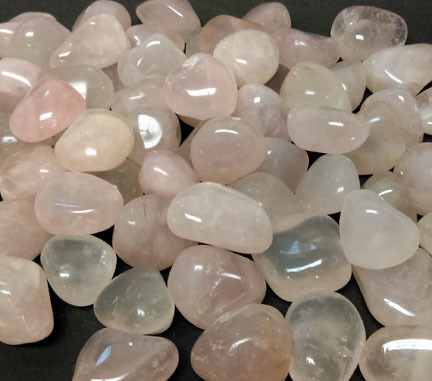 Rose Quartz tumbled stone is available in two sizes: Medium and Large and are sold in 2.5 lb bags. 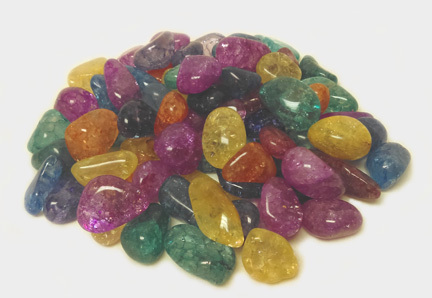 Medium stones are approx 3/4" and Large stones are approx. 1". Price is $10.00 a pound, sold in 1 pound bags. 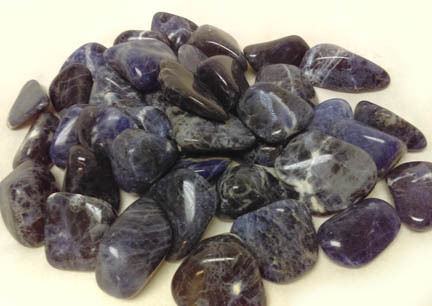 Sodalite tumbled stone is available in two sizes: Medium and Large and are sold in 1 lb bags. Medium stones are approx 3/4". Large stones are approx. 1". 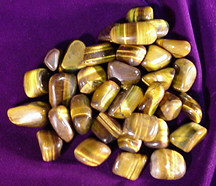 Golden Tiger Eye Tumbled Stone is available in two sizes. Sold in 1 lb. increments. Calcite is a very common and widespread mineral with highly variable forms and colors. 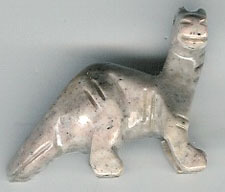 It is found in most geologic settings and environments in one form or another. Calcite is truly one of the best collection type minerals. 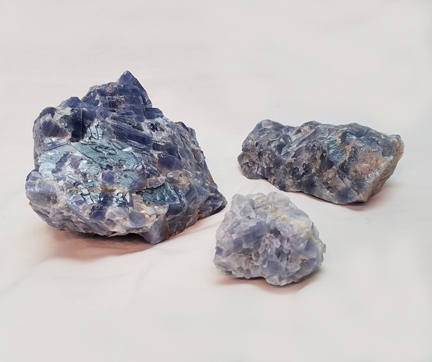 These Blue Calcite pieces are colorful and beautiful specimens to collect! Priced by weight at $5.00/lb. Shape and size will vary. We offer a few grades of Chrysocolla, this is the A Grade variety. Priced by weight, this product is available in 6 price ranges from $1.00 to $200.00.